Ben LaMar Gay is a Chicago creator and resident artist for Inferno. He has been facilitating Inferno sessions for 5 years. Currently, his focus is on therapeutic recreation participants and exploring their unique relationship with sound. Gay is a multifaceted musician who moves components of sound, color and space through folkloric filters to produce brilliant electro-acoustic collages. The unification of various styles is always in service of the narrative and never a pretentious display of technique. Gay's true technique is giving life to an idea while transforming the idea behind the term “Americana”. Rob Frye was Born in Cape Girardeau, Missouri 1987 and grew up in St. Louis where he began playing guitar and saxophone. He moved to Chicago in 2006 to attend DePaul University’s School of Music where he graduated in 2010. Since then he has pursued the muse of sound along with the rest of the artistic community embedded in Chicago, and alternated his summers between working as a field biologist for the Institute for Bird Populations in California and as a counselor/resident artist for Chicago Park District’s Culture Arts and Nature programs (one summer with Nature, and two with Inferno Mobile Media and Recording Arts). ...with synthesizer, flute, saxophone, clarinet, guitar and drum, Rob Frye from Chicago is present in the bands Bitchin Bajas, Cave, El is a Sound of Joy, and more. With his own project Flux Bikes, he also uses his bicycle as an instrument. The performance begins before the concert, riding to every appearance and continuing to experiment with dynamics, poly rhythms and loops. The tires tell of the journey between melody, noise and sound intervention. His collaborative trips range from the local to the international. Nicholas Cline writes acoustic and electroacoustic music – often a quiet music with an emphasis on subtle, nuanced sounds. Deeply influenced by the natural world, his music often draws on sensuous as well as intellectual experiences of nature with the belief that music should reveal, challenge, and shape the listener’s understanding of the world. His music has been performed by the Crossing, Spektral Quartet, International Contemporary Ensemble, BCE Vocal Ensemble, and Northwestern Contemporary Music Ensemble. He has been commissioned by Jeff Siegfried, Jena Gardner, nois~ Saxophone Quartet, and Constellation Men's Ensemble. His music has been presented at festivals in the US and in Europe. He is featured on the SEAMUS electroacoustic miniatures recording series: Re-Caged and was a High Concept Labs sponsored artist. Tkumah Sadeek (Tic-oo-mah Suh-deek) is a vocal recording artist, poet, performer, as well as skilled songwriter and vocal arranger. Utilizing the transformative power of words and the healing element of music her sound combines the emotive qualities of tone, melody, and harmony with intense poetic lyricism and powerfully nuanced vocal styling. The essence of Soul, Jazz, Rhythm & Blues, Hip-Hop and Deep House all live inside her music and are fused with percussive rhythms and deep grooves. Her current releases on Future Vision Records are collaborative efforts with DJ/Producer Ron Trent. This includes songs such as “Crossroads,” “In Time,” “I Will Be There,” “Universal Love”, and “Till I See The Light.” These songs have garnered worldwide acclaim among music lovers and house music fans alike. As a resident artist with Chicago Park District’s Inferno Mobile Recording Studio, Tkumah has sought to give the youth participants a greater understanding of the fundamental components of song creation and empower artistic expression through beat making, lyric writing, and recorded vocal expression. Selah Say is a Chicago based DJ, Performer, and Co-Founder of Make Weekdays Great™️ a lifestyle brand and creative collective focused on enriching everyday of the week through our Instagram advice series, #ReallyGoodAdvice, developing engaging programming, and creating events that provide mindful culinary experiences intentionally creating menus for our events which incorporate the same caliber of entrees for vegans, vegetarians, & meat eaters alike. Selah Say hails from South Carolina where as a child, she spent her days singing, listening + absorbing to music from all genres & time periods, & dreaming of spreading her wings beyond the South. Her first stop was Philly, then NYC’s downtown scene, then Charlotte, NC, India for a period, and now Chicago. Selah Say effortlessly blends music from many genres & in any given set, you can hear music ranging from 90’s R&B, Classic Rock, 60’s Nigerian Funk, to Trap & Soul, Classic TV Show Theme Music and all in between. Born and raised in Chicago, Illinois, Hameed Weaver began his musical career playing drums throughout middle school and high school band. In 2013 he moved to Grinnell, Iowa to attend Grinnell College where he graduated in 2017. While studying French language and literature he was an active member of the art and music community on campus. Throughout his four years he hosted a weekly radio show called “Black Kids Do Radio Too”, organized weekly cypher rap sessions, shows, and parties throughout campus. After graduating he continued his radio show at WHPK for a year while working part time and making music. 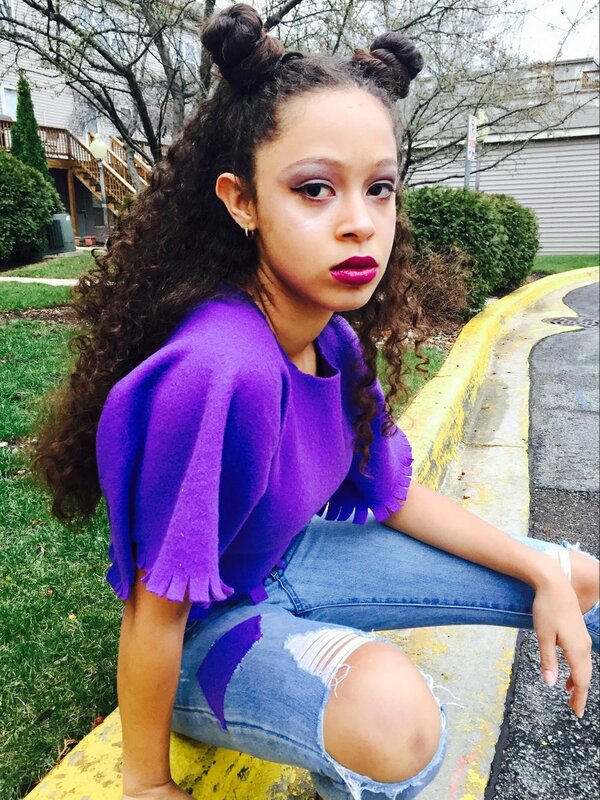 Tayvia Danielle Ridgeway is a young developing artist from the city of Chicago. She comes from a mixed background; her races being Black, White, and Native American. Coming from a family deeply involved with art, Tayvia’s journey with art and media making started at an early age. Tayvia uses mixed media including painting, drawing, and photography to display her creative vision. She not only creates portrait commissions for family members, but also loves to express her identity and background in her pieces. Tayvia has also created pieces for the organization After School Matters, some of which have been sold at the After School Matters branch in downtown Chicago. She also designed and painted murals for after school matters at the McCormick Place. In the future, Tayvia wishes to take her skill further, and become a working artist.